When enabled Java, a Slightshow appears to the right . It shows the content of this page. 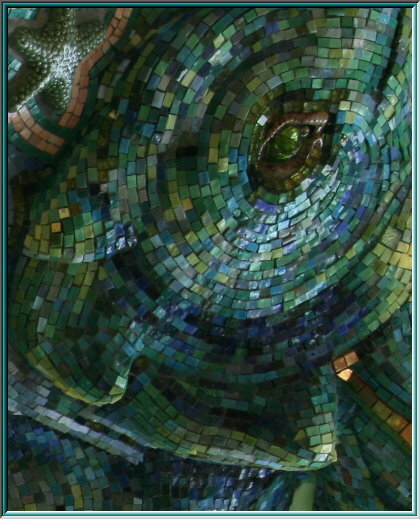 It offers the opportunity to look at the mosaics in full screen mode. All presentations are provided in the following, with documentation. The delicate art of mosaic. 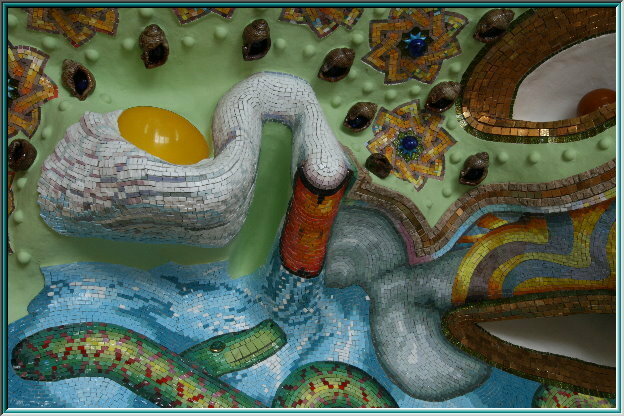 Fantastic Realism and Surrealism in the mosaic. While the Greeks and Romans, used glass smalts for mosaic economically, they processed ceramics, marble, precious stones, gold tiles, Terazzo and stone to luxuriant art works of the mosaic. In the Alhambra / Granada pebble stone mosaic adorns moorish gardens. 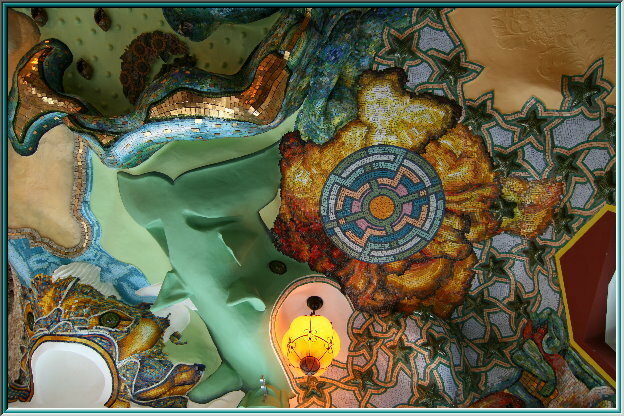 The influence of the Moors on the Spanish art, especially on the art of Antonio Gaudi is irrefutable. 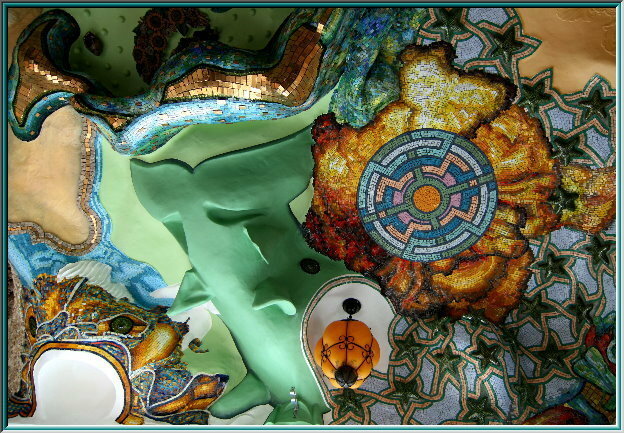 He combined moorish art with the Jugendstil and created a unique form of the mosaic. The Spanish architect Lluis Domenech i Montaner .is worth mentioning, too. 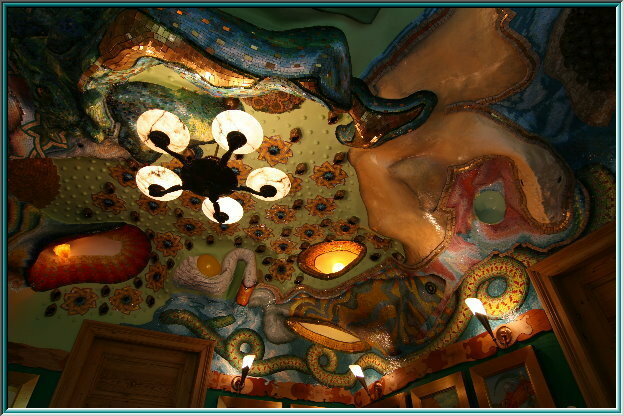 He also dabbled in the symbiosis of moorish ornaments with the art of the Jugendstil and leftgreat works to the mosaic art . . Friedensreich Hundertwasser continued this form of mosaic. The marquetry of the valuable jewellery stones allow an unusual design. The elegant mosaic stones particularly of glass, but also of ceramics, semi-precious stone, gold, marble among other things permit amazingly unusual shaping, character and structure. Endless design possibilities by variety - colors - forms. 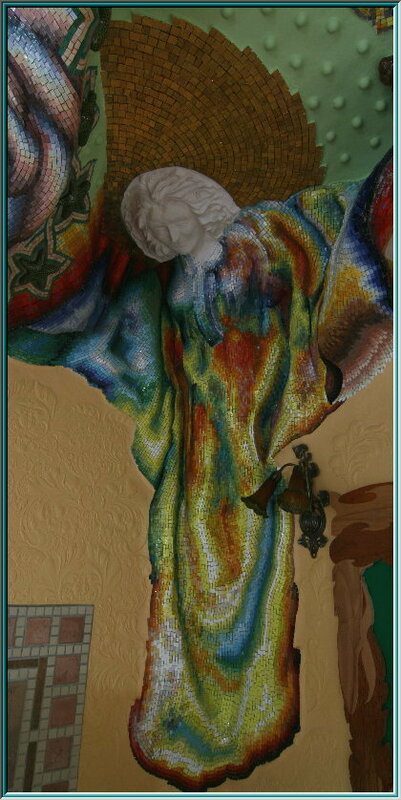 Mosaic in the third dimension - the sculpture in space. A Nouveauté of traditions developes - rich Byzantine art. For gold smalts real gold leaf is used for the gold tiles. The materials for the mosaic jewellery - marble, stones, glass, ceramics tiles, gold, precious stones are relatively resistant, which is why this art is preserved for a long time. The Italian town Ravenna proofs this in an impressive way. Till this day the glow of the Early-Christian Byzantine art of the 5th and 6th century has been preserved. 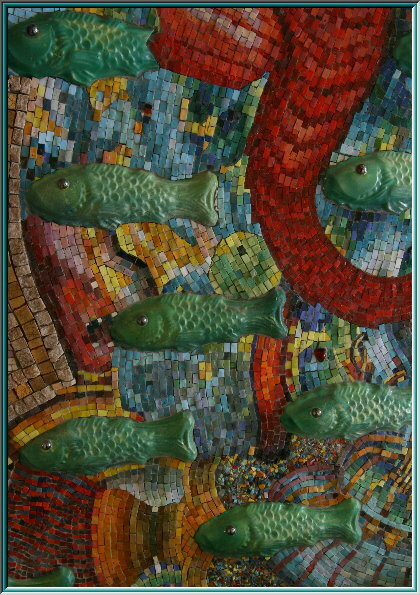 In the insignificant churchesyou can find true precious objects of the mosaic art. The processed gold smalts and precious stones testify to the wealth of the past times. 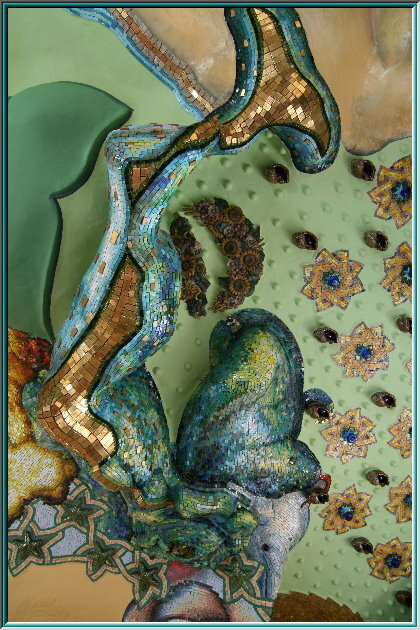 - Natural stone mosaic - ceramic mosaic - glass mosaic - leaf-gilt smalts- glass Nuggets - Smalti Veneziani - agate - quartz - opal in manifold graining. 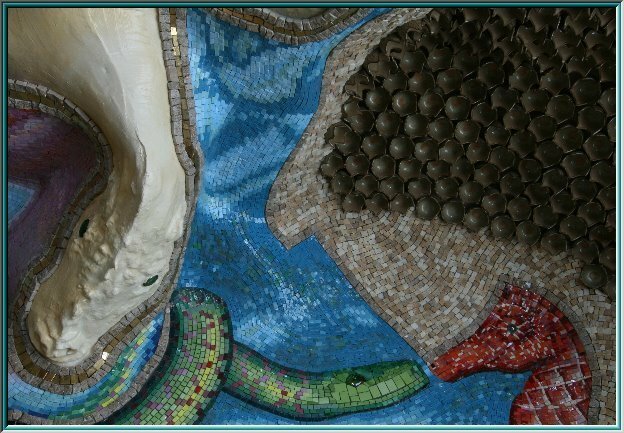 An undriable well of jewellery for art and the design of swimming-pools, saunas, wall - and ceiling mosaics. With 8000 m ² of mosaic Basilika San Marco / Venedig is another example for the prodigal jewellery in the mosaic art. Gold and precious stones, marble tiles, glass smalts, selected ceramics. Golden glow wherever the eye looks. 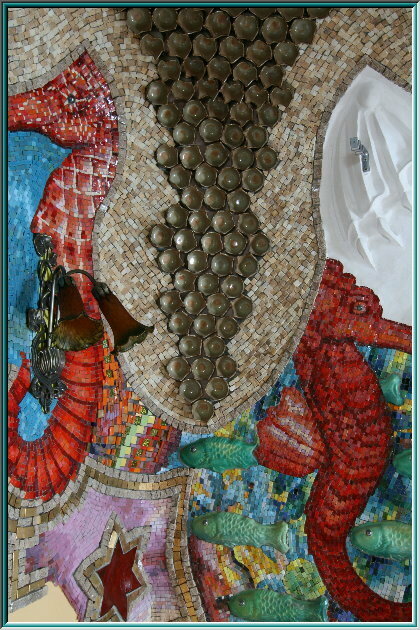 History of the design..
Sea Serpent / mosaic seahorse / mosaic / ceramic elements of natural stone. More than just art and design. 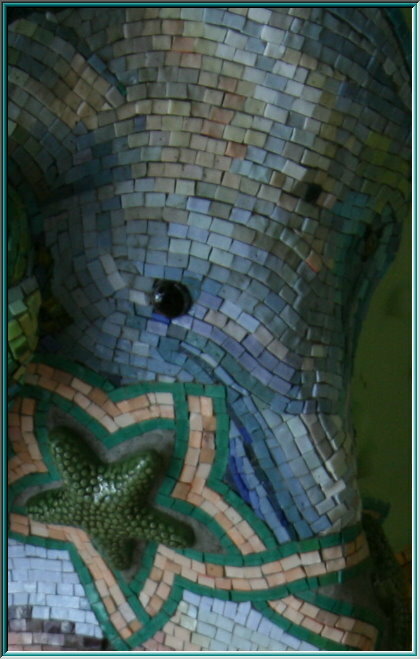 Finding pieces, pearls, ceramics, tiles break, stones, mussels, glass of splints -almost all objects can be joined in a mosaic. A new design originates. 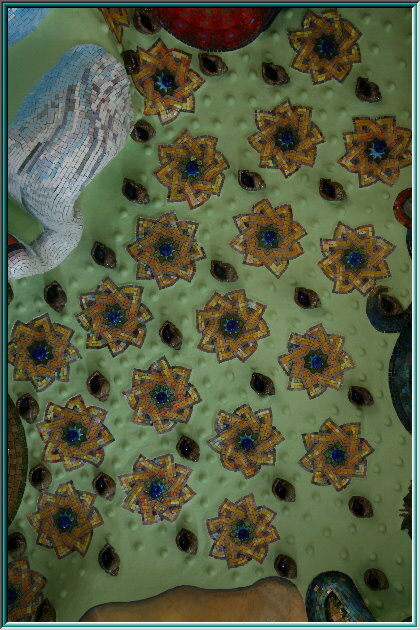 To avoid crack formations caused by the not unimportant weight of the elegant mosaic stones of glass, jewellery ceramics, semi-precious stone, gold tiles, marble inter alia, the ceiling is stabilized with metal armourings and armouring fabric. are well applied in manual labor. 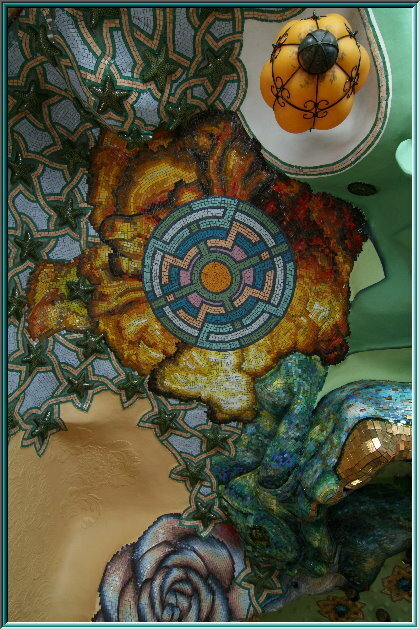 Improving gold ceramics / gold smalts accompany the decorative richness of the mosaic art. Everlasting fresh colors of the smalts. The light of the sun, caught in glass and gold to reflexes. 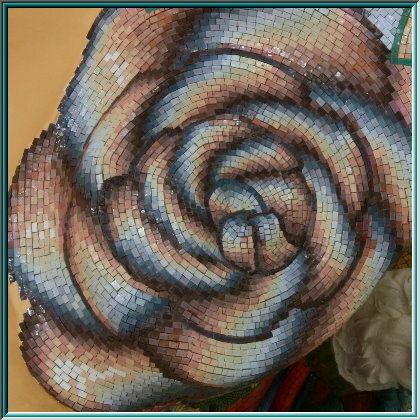 An ordinary piece of the mosaic will cost between 4 cents and 7 cents. 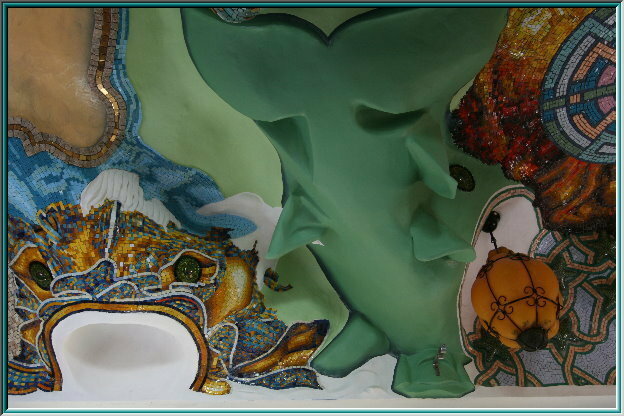 Everyone providing a mosaic today,converts besides jewellery ceramics, design tiles, marble, nature stones, necessarily glass / gold Smalten of Orsoni. gold smalts ,design tiles or precious stones. Fine ceramics, glazed ceramics, Raw ceramics, form ceramics, art ceramics. The face of the angel has been modeled on the ceiling. The Muslim art in Spain has created unprecedented works of art. the most resistant design materials . A mosaic means to put a lot of time. Sometimes you think it would never end.